Finally the bathroom is completed! Well, nearly...there is always a little something to be done and in this case I am still working on the blind. But I thought the room was good enough to photograph and I couldn't wait any longer! Above is the view from the hallway looking into the bathroom. The flooring is French oak with a lime wash finish. The walls are painted in an off-white colour called "Limed White" (half strength) and the trims are painted in "Antique White USA", both Dulux colours. 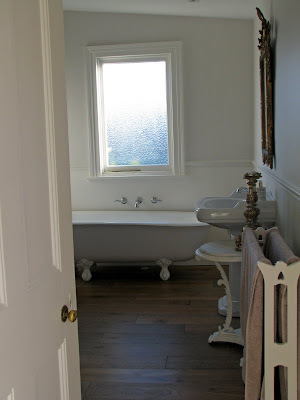 The Victorian claw foot bath is original to the house and is against the far wall under the window. We gave it a fresh finish of paint. I am yet to use it! The mirror above the basin is an antique. It is quite ornate but the simplicity of the rest of the room is a good contrast, I think. 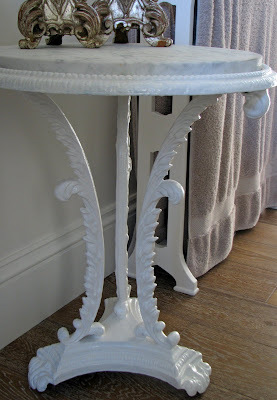 This cast iron table is from the Victorian period and has a white marble top. It would have originally been used as a garden table. The towel rail is also antique. 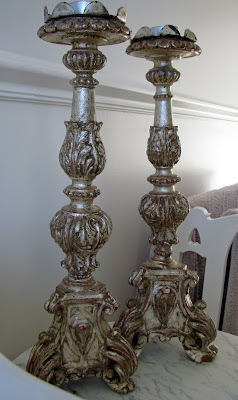 These silvered Italian candlesticks date to around c.1800. Again, I am yet to use them but I have some candles ready. The taps are by Nicolazzi, an Italian tap ware company with products now available in Tasmania (see previous post). The painted cupboard is one I bought last year on one of our overseas buying trips. It has finally found its true resting place (it has been in our living room for a little while, see previous post). It is used for storage and is filled with towels, soaps, lotions etc. 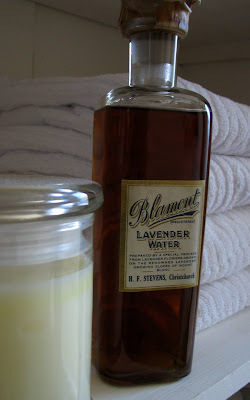 An antique lavender water bottle (and original contents) that I found in New Zealand years ago. Actually, it was on my honeymoon which gives it special meaning to me. 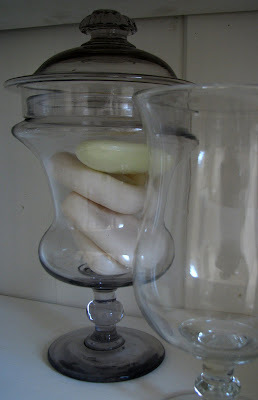 An antique French glass jar holds soaps. Antique jars, pots and Victorian footbaths in the painted cupboard are used for storage. 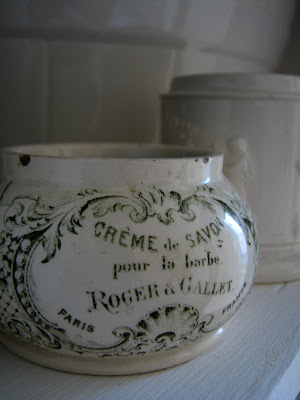 I am particularly fond of this little Roger and Gallet pot above, which is French. "Creme de Savon pour la barbe" translates to shaving soap for the barber. It now holds hairpins! These antique apothecary jars are also used for storage and are on the bottom shelf of the painted cupboard. I found these earlier in the year overseas and bought them immediately with the bathroom in mind. Most of them have their original apothecary labels on them. This large Victorian bowl is also a recent find. It is huge! It is on top of the cupboard as it didn't fit inside as I intended. I am unsure what the "K" stands for, possibly kitchen? Or it could represent the family name. 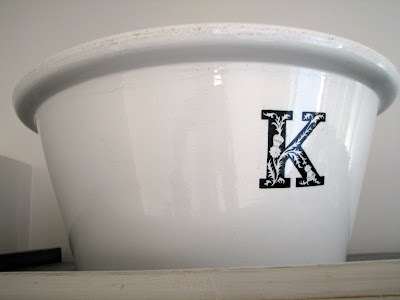 We had a smaller such bowl, also with a "K" in the store but it sold last week. The best part about using antique furniture for storage? You can take it with you if you ever move houses. 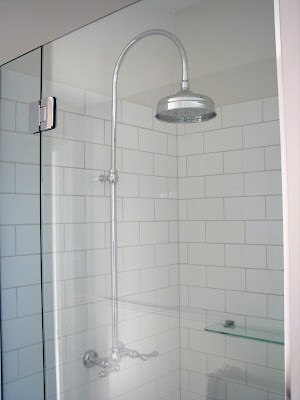 The shower is tiled with simple white brick tiles and a pale grey grout. The tap ware and overhead rose is again Nicolazzi. Your bathroom reveal is gorgeous! You must be so pleased. I love that you have kept the style and respected the house and not for example gone ultra modern as some do. I am always pleased when someone uses and loves Antique white USA as I am crazy about that colour and have used it in my own home.....I could drown myself in this colour, it is just so beautiful and is a true classic and I know I will never tire of it. 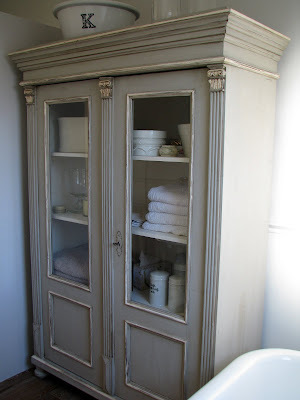 The antique cupboard looks right at home in your bathroom and I love the colour of it and love what you have put in it as well. 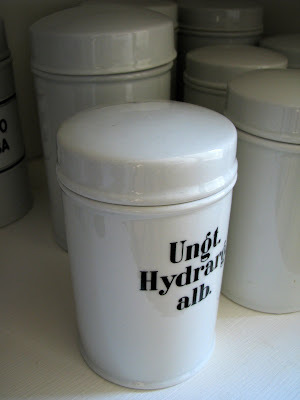 I came across some apothecary wooden containers a couple of years ago that a lady sold me from her personal collection. I bought three and loved them instantly and when I opened them they had 3 glass beakers in them. I think if the house burned down I would have to grab them as I love them so much. Love the mirror, table and candlesticks. Wonderful job Tammy. Now go light those candles and have a soak in your tub, you deserve it. Hi Janine, I am glad that you like my room reveal...it certainly was a long time coming! But I think it makes you appreciate rooms better if they are painstakingly slow to transform (as EVERY room in my house has been). 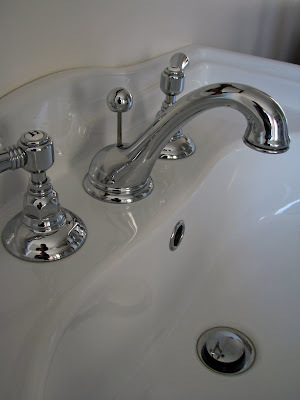 Antique White USA is classic and I have used it throughout the entire house on all the trim colours. Your little wooden apothecary containers sound quite unusual, hold onto these. WOW Tammy! Your bathroom looks so gorgeous - I bet it was fun taking the photos to show off your handiwork! 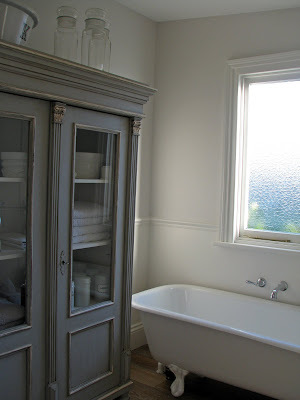 The bath looks like it is begging for someone to use it (which reminds me, this may be a silly question, but how do you re-paint a bath - do you have to use special paint?). Your shower head looks like it would be dreamy underneath it (plus the design is gorgeous). And I'm completely in love with your beautiful antique cupboard. All in all - completely droolworthy! I just sigh at the sheer elegance of your antique furniture. Your bathroom looks like a luxurious space in an old hotel. I’m actually playing with the idea of modern and vintage, so seeing those jars and candlestick gave me an idea. Just add some scents, and soaking in that tub will be a perfect experience! I like your bathroom because everything in here -- from the fixtures up to the bathroom accessories -- defines a vintage aura. Where did you get those? Do you go to auctions to look for vintage items? The window caught my attention, by the way. It looks nice and it matches well with the other details on the bathroom. The blurry design on the glass is perfect for the area too. Hi Tammy, your bathrooms is absolutely fab! Would you mind telling me the dimensions? We are re doing our very small bathroom and I love your layout but am not sure if we could fit everything and maintain the spacious feel that you have.